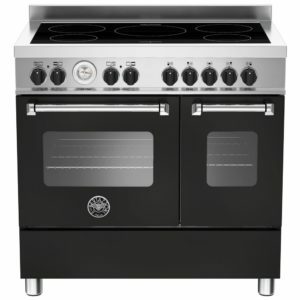 This attractive 100cm wide range style cooker from Rangemaster features electric ovens and a five zone induction hob. 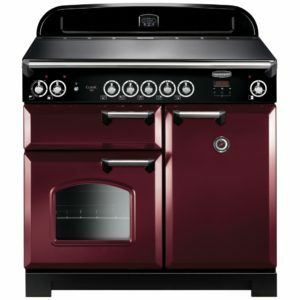 Finished in cranberry with chrome trim it will create a stunning focal point in your kitchen. The energy efficiency rating on this model is A/A and it comes with a two year parts and labour warranty as standard. 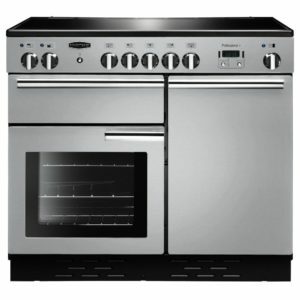 Enjoy contemporary styling with added luxury with the Nexus induction range cooker from Rangemaster. The 90cm NEX90EISL/C is not only aesthetically pleasing, with its sleek lines and slate and chrome finish but will make cooking a pleasure no matter what the occasion. With two electric ovens, one multifunction and one fanned, a five zone induction hotplate and a separate grill, you'll have all the tools you need to make delicious meals for all the family. 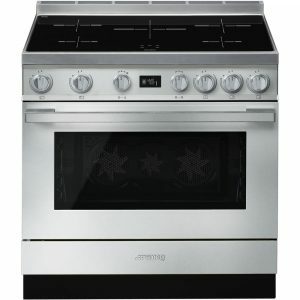 Simply stunning is the only way to describe the Symphony induction range cooker from Smeg. It looks breathtaking in black and it will be the dazzling centrepiece of your kitchen, offering all the flexibility and space you ever dreamed of. With 126 litres of oven space split between two ovens, one multifunction with 7 cooking functions and a static oven with 6 cooking functions, you will also benefit from a separate grill, 5 zone induction hob and a brilliant storage drawer. What Smeg are masters at is brilliant, iconic design with cutting edge technology and that is exactly what they are offering you here. Lucky you! 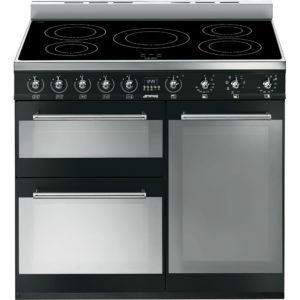 Belling are offering you this very elegant induction range cooker finished in black. If you love cooking, and with this range cooker we can guarantee you will, you will have all the space and versatility you need. Belling are giving you a very generous 144 litres of space split between two ovens. The main fan oven has a very useful slow cook function and there is a separate grill. The induction hob has 4 heat zones, each with a boost function. Easy clean oven interiors make cleaning fuss free so you can concentrate on your cooking. Belling have very cleverly given you cooking versatility and durability combined with a gorgeous traditional style with modern touches. 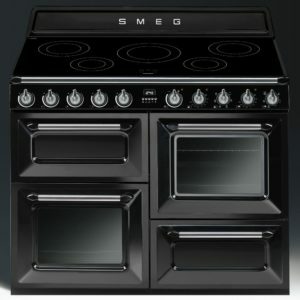 If you want to cook in true style, then this black 'Victoria' range cooker from Smeg will allow you to do just that! Offering a five zone induction hob, two electric ovens and a separate grill, you'll have plenty of room and options to cook up a feast. There is even a storage drawer to keep your pans neat and tidy and teamed with the easy clean enamel interior and removable roof liners, you'll be able to keep it nice and clean too! Designed to complement Smeg's iconic 50's style appliances, such as their fridges, dishwashers and washing machines you'll have a kitchen that oozes style. The Rangemaster Elise induction range cooker in white can be summed up in one word - perfection! It is stunning and it will absolutely add the wow factor to your fabulous kitchen. It is a cook's dream with a massive 155 litres of oven space split between two ovens, one multifunction and the other a standard fan. 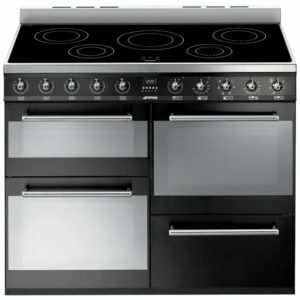 Featuring a fabulous glide out grill and a 5 zone induction hob, you will be totally spoilt for cooking options. If you found cooking a chore before, we can guarantee you will love it now. 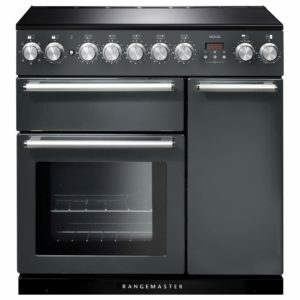 Rangemaster bring a professional touch to your cooking by utilising all the expertise they have gained as leaders in this field. 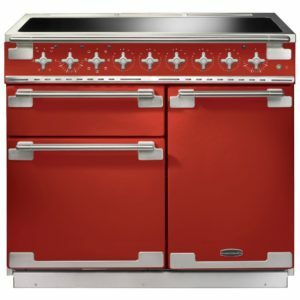 What you are getting here is quality, durability and cooking excellence wrapped up in incredible style and timeless beauty. A stylish addition to a kitchen, this fantastic range cooker from Smeg will provide great cooking options for you to cook up a storm! Finished in cream and designed to complement Smeg's retro range of appliances, you can create some great meals thanks to the 2 spacious ovens and separate grill compartment. With Vapour clean functions to break down any spillages and an easy clean enamel interior, maintenance will be a breeze. It's also topped with a 5 zone induction hob, providing efficient cooking and heat transfer with plenty of space for all your pans! 'Technology With Style' is Smeg's mantra and they have hit the jackpot with this fabulous Opera pyrolytic induction range cooker in sassy stainless steel. It is literally dripping with style and drowning in fantastic technology to ensure your cooking experience is always a brilliant one. Two superb ovens give you so much flexibility to cook with ease. The main multifunction oven has 10 cooking functions including a grill and rotisserie. The second oven has 6 cooking functions and a rotisserie. The main oven is self cleaning whilst the second oven has easy clean liners. A 5 zone induction hob offers more space and versatility for conjuring up culinary creations and the fantastic storage drawer is an incredibly useful addition. 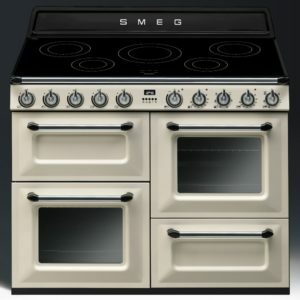 Smeg always manage to wow us with their stunning design and clever technology that is always bound together so perfectly. Proudly made in Britain with professional results every time, this stunning stainless steel range cooker from Rangemaster features a wealth of features for the serious foodie. With two electric ovens, five induction cooking zones and the glide out grill, you'll have everything you need to cook like a pro. With added features like the unique HandyRack located on the inside of the oven door, you'll have easy access to check and tend to your roasts. The energy efficiency rating on this model is a desirable A/A and it comes with a two year parts and labour warranty as standard. 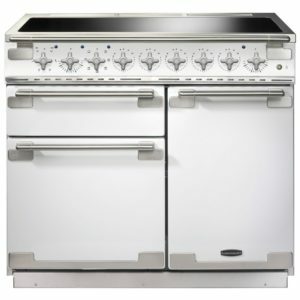 You will be able to cook up all of your favourite treats using the great features on the Professional Deluxe from Rangemaster, designed with performance in mind. There are 2 roomy ovens, with one offering multiple functions so you can pick the best cooking option for every meal. There's extra cooking space offered with the 5 zone induction hob top, which quickly heats up pans and provides fine control for the most delicate warming or melting. 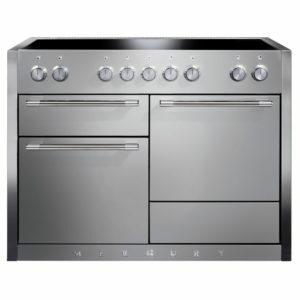 Finished in cool slate, this cooker has clean, modern lines for a stylish addition to your kitchen. 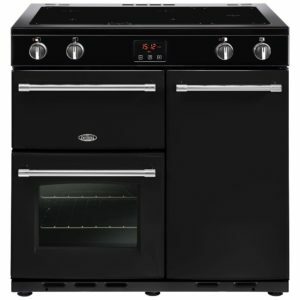 This stunning 90cm Portofino pyrolytic range cooker from Smeg is a great choice for modern kitchens. 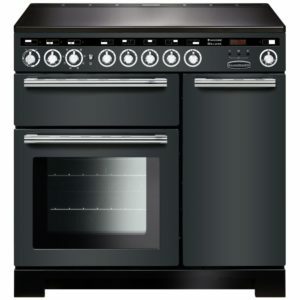 Featuring an electric oven and a five zone induction hob, it will give the keen cook everything they need to cook up a storm. Finished in stainless steel with heavy duty cast iron pan stands, it's bound to create a stunning focal point in your kitchen. Half Price Matching Hood And £200 Cashback! The brilliant, sleek design of the Encore Deluxe makes a stunning feature, and finished in slate with chrome trim you are sure to turn heads with this in your kitchen. With a handy multifunction oven, you can easily find the function you need for every meal. 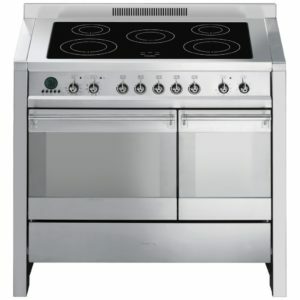 There's a secondary electric oven and grill compartment, so there's plenty of space for cooking a great range of foods. The 5 zone induction hob top provides brilliant power with fine control, so you can just as easily melt chocolate as boil potatoes! We have a whole range of induction hobs for you to check out if you’re thinking of making the switch to induction cooking. You’ll find them amongst all our other hobs. 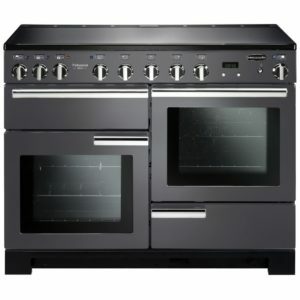 Head to our cooking section to have a look.We also have our full selection of range cookers, built in ovens and more. Need a cooker hood to match? We have a bunch of different styles and designs for you to browse from in our extraction section. For more great kitchen appliances, head to our refrigeration section and small appliances section. From American-Style fridge freezers to coffee machines, there’s something for everyone at Appliance City.